BGR Feb 2016 Issue ‹ Black Girls Ride Magazine | Motorcycles, Accessories, Biker Fashion and Events for Women Who Ride! In honor of Black History Month, this issue is dedicated to those ladies who paved our way for Black Girls Ride Magazine. We pay homage to the Cycle Queens of America, the first Female MC founded by African American women. 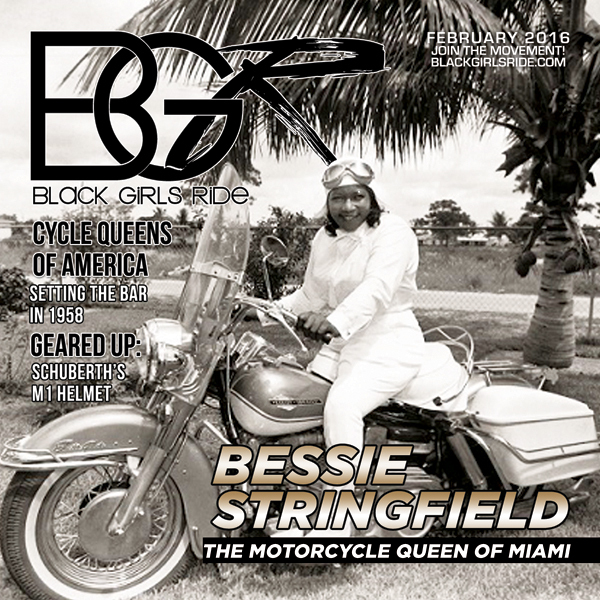 We’ll meet the legendary, Bessie Stringfield, the Motorcycle Queen of Miami. We’ll join Sarah “SeCCRet” Moreau for a Long Distance Rider Orientation. We’ll go Off to the Races with Road Racer, SJ Harris. And, we’ll get Geared Up with Schuberth’s Metropolitan 1 Helmet. View it online now! The Cycle Queens of America: Because Of You, We Can. Gin Shear, Exec. Dir. Women's Motorcyclist Foundation, Inc.
Super issue this month! Wonderful articles about some amazing and courageous women. Thank you for keeping us informed and educated.